While the whole gaming world is waiting for GTA 5 release date, the developers of Saints Row 4 decided to announce their own GTA V... or to be more precise - GATV DLC. Also another one add-on for Saints Row 4 - Wild West - is coming sometime soon. 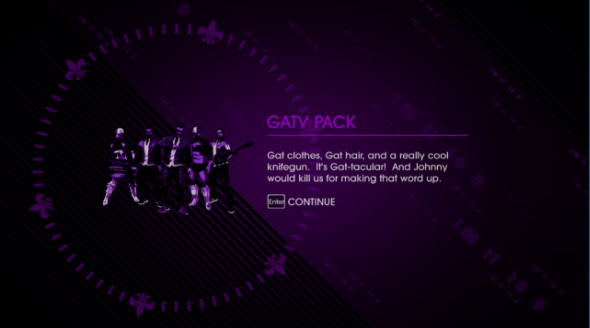 Today the promo image of GATV DLC has been leaked and it shows the Johnny Gat themed add-on that includes special clothes, haircuts and weapons. For now we don't know any other details, for example, the price and the release date, but we are almost sure that GATV pack will be launched during this week, because GTA 5 is coming tomorrow, on the 17th of September. The other Saints Row 4 DLC that is coming soon is named Wild West. It will also contain different weapons and various stuff, which as it becomes clear from the add-on's name will be inspired by cowboys. By the way, Saints Row 4 is on top of the UK charts for four weeks already, and if you haven't played it yet, read our Saints Row 4 review to find out more.